Dropping a heavy solid item – yes we can always get a bit sleepy after eating too much lasagna, but the dish still needs to be cleaned, and accidents can happen! Pouring very hot water into the sink – like everything else, ceramic likes to expand when it is heated. Pouring hot water into the sink will cause the surface being heated to expand rapidly, while the underside of the sink will not budge – this is very likely to result in a crack! Broken ceramic edges can be as sharp as a razor and you can get very nasty cuts and splinters from it! Wear gloves when handling the broken pieces! Until recently, getting a crack in your ceramic sink was a major problem – your choices were to either live with it or get a replacements. But new solvent products have recently been developed which allow even inexperienced DIY’ers to have a go at fixing the crack themselves. And the results can be very impressive, with some users saying that they cannot even identify where the original crack was! 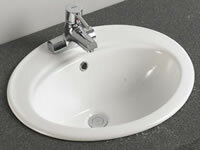 The repair kit can be used on enamel, ceramic and acrylic sinks. .